Kalkan is a son of a Working Anatolian Pair owned by a landlord in Ciftlik. 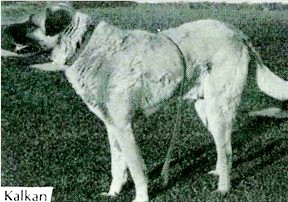 Kalkan was picked for his behavior and disposition and given as a gift from the Ciftlik landlord to Canadian friends who were living in Ankura, Turkey. Kalkan started boarding and working at Masallah Ranch in 1983.